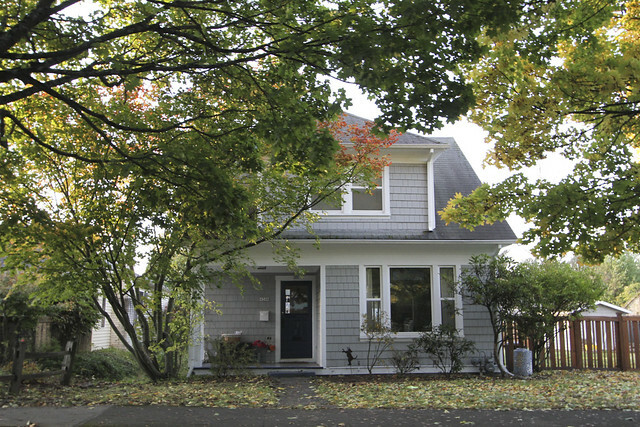 Woodstock is a beautiful historical neighborhood nestled in lower Southeast Portland filled with charming coffee shops, restaurants, parks, a great library and schools, and affordable craftsman bungalow homes for sale. Located up the hill from the gorgeous Reed College campus, featuring a nature reserve and a picturesque lake, Woodstock is like a small college town within a big city. Neighbors are usually on first-name basis, and congratulate each other on life successes and support each other through hard times. Residents are a mix of young couples, artists, musicians, college students, long-time Portlanders, and working-class families. The neighborhood has every amenity you could want, from a newly remodeled supermarket and amazing Thai food to furniture boutiques, salons, and bike shops. This close-knit community hosts a yearly summer festival celebrating the individuality of the neighborhood, including a parade, food and craft vendors, and family-friendly activities. The main commercial area runs along SE Woodstock Blvd. between SE 39th and SE 52nd Avenues, while the surrounding streets are primarily residential, and extremely safe for walking, playing, and chatting with neighbors. 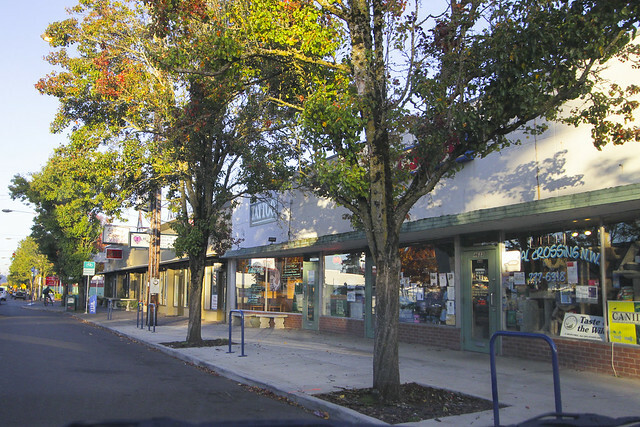 Woodstock is one of the oldest neighborhoods in Portland, first platted for development in 1889. The land that would become the Woodstock neighborhood was settled by Methodist minister Clinton Kelly from Kentucky, and was primarily a residential estate before the first neighborhoods and commercial centers were organized. Sir Walter Scott's romantic novels were incredible popular in the late 19th Century, and Woodstock was one of the most popular titles, resulting in the neighborhood's naming. Many of the houses in the Woodstock neighborhood date back to the late 1800's, including stately Queen Anne homes, Victorian classics, and craftsman bungalows. 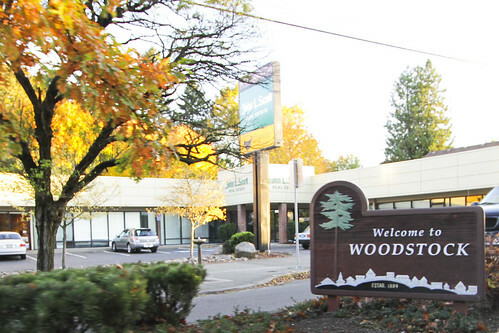 Woodstock is located in inner Southeast Portland. 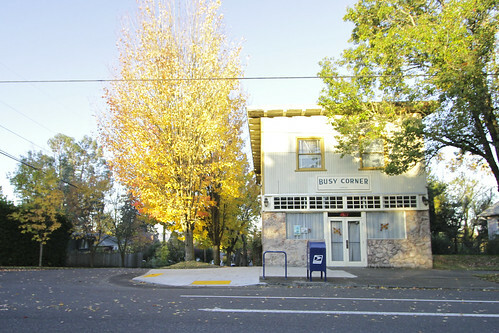 The neighborhood's northern boundary is SE Holgate Boulevard, and the district extends to the west to Cesar Chavez Boulevard (formerly SE 39th Avenue), east to SE 60th, and south by Johnson Creek Boulevard. Woodstock borders the neighborhoods of Reed and Eastmoreland on the west, Creston-Kenilworth on the north, Mt. Scott-Arleta and Brentwood-Darlington on the east, and Ardenwald-Johnson Creek on the south. Three schools lie within the Woodstock neighborhood boundaries — Woodstock Elementary School, Lewis Elementary School, and Our Lady of Sorrows Elementary School — and are within easy walking distance of most residential areas in the community. Reed College is down the hill to the west, two blocks away from the main commercial district along Woodstock Boulevard. Woodstock School provides a unique learning environment, blending a Mandarin Immersion program with a traditional English only program in grades K-5. Students in the Immersion program receive Mandarin instruction for half the day and English instruction the other half of the day. Many homes for sale in the Woodstock Real Estate market date back to the early 1900's, especially in the neighborhood's northern sections. Popular home styles include Victorian, Queen Anne, Tudor, Craftsman, and homes and lots range in size. Post World War II housing construction is concentrated in the southern panhandle and the northeast corner of the neighborhood. Condos and town houses have popped up in recent decades, providing affordable comfort in this charming neighborhood. 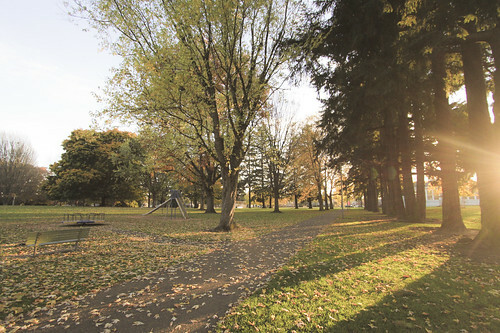 Woodstock Park: This sprawling, tree-lined park sits next to the Woodstock School and is a favorite place for after-school play. The park features softball and soccer fields, 2 tennis courts, horseshoe pit, playground, wading pool, picnic tables, paths, and restrooms. During the summer months you'll find people playing Frisbee and walking their dogs every day. Since the neighborhood is full of artists, you'll often find local bands and musicians practicing their craft, making the perfect backdrop for a sunny day at the park. Woodstock Library: We've been to most of Portland's libraries, and this is one of our favorites. It's not enormous, but it does have a good selection of books, movies, videos, audio books, and music CDs. The best thing about the Multnomah County Library system is that if an individual branch doesn't have what you're looking for, you can easily put it on hold and expect to be able to pick it up within a couple of weeks. Reed College Canyon: This 28-acre watershed in the heart of the campus includes the headwaters of Crystal Springs Creek, a tributary of the Johnson Creek Watershed, and Reed Lake, which has been deemed the oldest naturally occurring lake in Portland. Enjoy sights of Great Blue Herons, or try to catch a glimpse of mature coho salmon in the creek waters, some of the first Salmon to make it up the Johnson Creek tributary in over ten years. The path around the canyon winds through a century-old orchard, past giant uprooted trees, and features picturesque benches with glorious views of the lake. Here is a map of the Reed College Canyon for interested walkers. The Joinery: 4804 SE Woodstock Boulevard - A little bit of Arts and Crafts right in the heart of Woodstock. This furniture/home goods store is a haven for wood lovers. If you want a custom piece of furniture made with soul, the craftsmen and designers at the Joinery are always happy to welcome new challenges and requests. You will see in their showroom and catalog four primary styles: Mission, Shaker, Pacific, and Modern. One of the coolest things about the Joinery is that the wood they use to craft their furniture is certified by the Forest Stewardship Council, which means that the wood comes from well-managed forests. That's absolutely beautiful furniture that is good for the community, the environment, and your taste. Collage: 4429 SE Woodstock Blvd - This is an adorable art and craft supply store in the heart of the Woodstock district. The shop is full of super cute craft materials, paper, stamps, art supplies and gifts. The prices are very reasonable, and they offer fun classes to learn new craft techniques for both children and adults. The staff is very nice and mostly very knowledgeable and helpful with suggestions, and you'll always leave inspired to start a new project. Toast: 5222 SE 52nd Ave - Toast is one of the area's premier brunch spots, and they also serve up an amazing dinner. The food is great, the service is friendly and efficient, the atmosphere is tiny and cute, and there's coffee to serve yourself as you wait. The majority of the people that come here seem to be regulars, and the business owners recognize this and remember them - its always nice to have a neighborhood spot! Tom Yum Thai: 4309 SE Woodstock Blvd - This is the go-to restaurant for most Reed College studies taking a study break, and its a favorite of everyone else in the neighborhood as well. The pumpkin curry, the veggie rolls, the Tom Ka Gai soup and the Cashew Chicken are amazing, and the atmosphere is welcoming in all weather. Many Portland Thai places do Thai/Vietnamese, Thai/Korean, Thai/Chinese -- but Tom Yum is just great Thai food! Woodstock Wine and Deli: 4030 SE Woodstock Blvd - This place is a southeast Portland institution. It's been family owned and operated for over twenty years and counting. Woodstock Wine & Deli has the most delicious sandwiches in the area, and they are well worth the price. The staff behind the wine counter are very knowledgeable, and not pretentious in any way. This is the perfect place to find the perfect bottle of local or international wine for any event, at any budget!